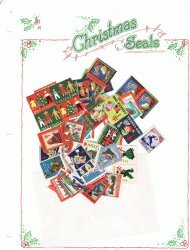 Canada Christmas Seal Collection Kit; Canada Christmas Seal Collection, 1927-56 as required, singles pairs, and blocks, with Colorful Blank Album Pages in package of twenty (20) sheets. Just add your own binder. 1927-56 Canada National Christmas Seals Collection, as required, with colorful Blank Christmas Seal Stamp Album pages. Just add your own binder. A great collection for someone interested in Canada Christmas Seal Collecting. Mint Canada Christmas Seal Collection, 1927-56, includes U.S. lookalikes, as required, singles, pairs, and blocks. full gum, F, NH. French and English Seals are included for years 1927-1951. Scan is an example of seal collection contents. Seals in this packet are as follows: single stamps: 1927-1935, 1937-1942, 1944-1953; se-tenant pairs: 1936, 1943, 1955; blocks of 4: 1954, and 1956. This is the assortment described in the Green's Catalogs, and required to complete the various albums. Album Pages: New, blank, album pages printed on 8.5x11" acid free 67 lb. ivory or white card stock, round corners. Fifteen (15) pages which are punched for a three ring binder. Add a packet of stamp hinges for just $3.00 more. Stamp Hinges: Uni Safe PreFolded Stamp Hinges, package of 1,000 hinges. 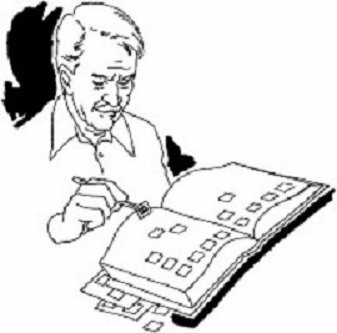 Hinges are made from a special acid free gummed paper. Prefolded for convenience and to save time.